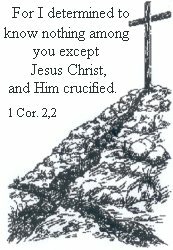 24 Then Jesus said to His disciples, "If anyone wishes to come after Me, he must deny himself, and take up his cross and follow Me. 25 "For whoever wishes to save his life will lose it; but whoever loses his life for My sake will find it. 26 "For what will it profit a man if he gains the whole world and forfeits his soul? Or what will a man give in exchange for his soul? 27 "For the Son of Man is going to come in the glory of His Father with His angels, and will then repay every man according to his deeds. We are not reading about the salvation itself here, for what it is concerned, the speech about deeds are totally out of the question. The Word is as clear as anyone could wish for when it comes to that! - But Gods Word also speaks about the difference in the reward for the believer. And it speaks about that the believer will continue building on the foundation of Christ, with different kinds of material - someone with noble, others with nothing noble, but even those who build with the kind of material that got burned up in the test, will be saved – though trough fire. (1 Cor. 3:11-14). We human beings became in reality our own gods through the fall! We became self-worshippers. It was then we fell for the temptation: “You will become like God,” and therefore naturally live by it. We want to be the biggest, the greatest, most praised and honored etc. If we have to admit to our littleness, it will brake our self-image, our self-esteem etc. This is where it has its reason. But what the Word speaks about is that the heavenly life starts here and now. You can take part in it now! This is exactly what Jesus sacrifice has given us access to. But not as all of those who preach in the so called glory theology. That only opens up for the natural humans desires – to achieve a paradise here on earth. No, it speaks of owning a life in God, here and now and to grow in it. “Therefore, brethren, since we have confidence to enter the holy place by the blood of Jesus,” (Heb. 10:19), and “for the Law made nothing perfect, and on the other hand there is a bringing in of a better hope, through which we draw near to God.” (Heb. 7:19). This is to follow Jesus! Believing in Him, and by that drawing near to God! That is to grow in the grace and knowledge of our Lord and Savior Jesus Christ (2 Pet. 3:18), and this hardly brings you to a paradise existence, concerning the earthly things, in this world, but rather to adversity and suffering of different kinds. When it is about being placed before the call, we have those invited it speaks of for example in the parable about the kings sons wedding (Mat. 22:1-14), who all chose Gods salvation away, for the benefit of what they had in this world. And nothing they preferred before Gods things were sinful things, let us make note of that! It was people who never had been on the inside and never came there, of this reason. The closer a human being gets to God, the more will Gods purpose for his life be fulfilled. You shall not as many preach about, seek about Gods purpose for your life, as seeking to come closer to Him, by Jesus Christ work of reconciliation. This preaching about “God has a plan with your life” will much more wear people out, than to give them desire for the Kingdom of God, and leads to a more or less longing after the “riches in Egypt”, which means the things in this world. And then He adds: “Or what will a man give in exchange for his soul?” (v.26b). If you won, and owned the whole world, you still would not have ransom for your own soul, it would get lost! What was gained then? In contrast to this, Gods Word says that the ransom for your soul is: Jesus blood! “For the Son of Man is going to come in the glory of His Father with His angels,” (v.27a), and “judgment must begin,” not with the rebellious world, but “the household of God.” (1 Pet. 4:17). And listen you who will get your wage according to your doing - because according to the Word of Jesus you shall - it is not spoken of how much or how big, but about this: Did you stay close to Him? What did He and His deeds mean to you? So much that you were willing to let go of something of your own? Let that be the question today and every day!